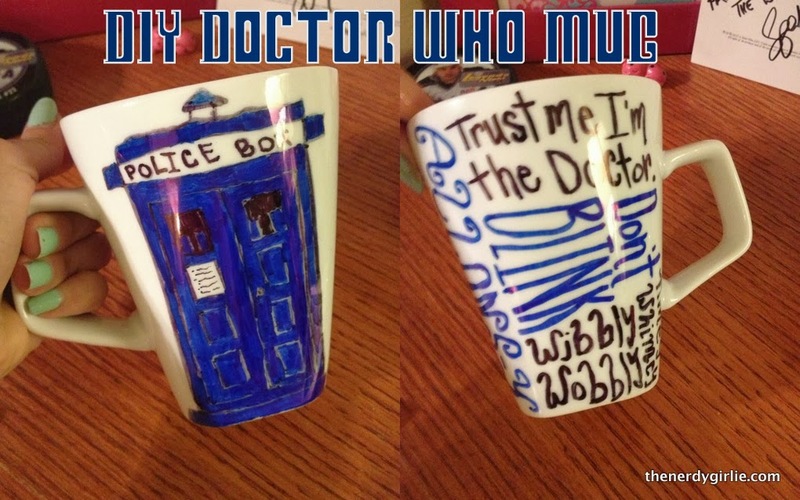 I made a Doctor Who mug for my sister in law for Christmas this year and decided I wanted one for my own. With my birthday coming up, I decided to make one as a gift for myself. The mug was purchased at IKEA for $2.99. They did have one for .99 cents, but I liked the shape of this one better. Step one: I practiced on paper drawing the TARDIS and quotes. Then I got out my Sharpies and went to town. If you mess up, it is easy to wipe off. Step two: When I had it how I liked it, I baked it in the oven on 450 for 30 minutes This was WAY too long!! Next time I would do it at 350. When I took the mug out, the blue was completely faded! So as you can see here I had to re-draw over it and was over it at that point, but you get the picture. It was super easy to do and I have used it once already. When washing try not to scrub the outside too much and do not put it in the dishwasher. Don't forget to share your creations in the comments below AND check out ALL our other Nerd Crafts! E, I just took some of my Doctor's favorite quotes: Allons-y, Don't Blink, Wibbly Wobbly Timey Wimey, trust me I'm the Doctor. Hope that helps! !